To spend the Christmas day on the beach is something that over 90% of people would like to experience at least once in a lifetime. The reason is that as a whole in the US, Canada and Europe this is impossible, at least in most places. The cold winter weather makes the idea to spend the holidays along the coast of some tropical destination really irresistible. The good news is that in order to escape the freezing, gray and wet winters are needed only a few hours by plane, and you will find yourself in a completely different world. If you want to experience an original and really colorful Christmas on the beach, one of the best places the world for this purpose is the Australian city of Sydney, and in particular, the popular Bondi Beach. You can often see something interesting there, such as Santa Claus and Snow White driving water ski or jet ski along the shore of the famous beach. This is why they often call Sydney ‘World’s Christmas Beach Capital’. The city is located in the southern hemisphere so at this time of the year the first really hot summer days begin. One of the hottest and most colorful tourist destinations in winter is the pearl of Colombia, Cartagena. Once the city was pretty infamous, but today it is a favorite place to enjoy the Christmas holidays for many rich and famous people, including a number of Hollywood celebrities. The city combines beautiful architecture, many entertainment options, good prices, bright colors, plenty of sunshine, friendly people, wonderful beaches and high temperatures in the middle of winter. Every year during the winter season from December to February the Brazilian megalopolis Rio de Janeiro becomes one of the world capitals of fun. This part of the year passes mainly under the sign of hot weather and beautiful golden beaches, the most famous of which are those of Barra da Tijuca, Ipanema and Copacabana. Since Rio is located in the southern hemisphere, the period during the Christmas and New Year holidays is the hottest and most dynamic time of the year. At the same time, the period between December and February is when most of the celebrations, festivals and carnivals are held. Riviera Maya (as they call the Mexican Riviera) is one of the best places in the world to visit if you dream about of a sunny Christmas vacation at the beach. This applies to the entire coastal area south of the popular Mexican resort of Cancun, especially for the resort centers of Tulum and Playa del Carmen. Riviera Maya is popular winter destination for many European and American tourists. In addition, winter is the best time to visit this area because this is a good way to enjoy the great beaches and at the same time to avoid the heat during the hottest summer months. Whitsunday Islands, which lie just off the coast of the Australian state of Queensland, offer an amazing combination of unique nature consisting of many endemic plant and animal species, wonderful beaches (some of them among the most beautiful in the world), peaceful atmosphere and perfect climate. The place becomes increasingly popular destination for spending the Christmas holidays year after year, and it already attracts more than half million visitors per year. The islands are a popular destination for yacht tourism. Miami is one of the warmest places in the continental United States. In addition, the city is known for the fact that here the weather is more pleasant in winter than it is in summer. Considering also the fact that it offers endless possibilities for entertainment and numerous restaurants and bars near the beach, Miami is a top winter sun destination in the country. Here is the best place to spend the Christmas Day near the shore enjoying the white sand and warm ocean waters, while in other parts of the world people are trying to deal with the thick snow cover. The most vibrant and dynamic city in Hawaii will make you forget that winter season exists. The weather in Honolulu is superb throughout the year, summers are very nice and warm, and winters will make you want to stay here forever. Not accidentally Hawaii is among the most popular places for winter break not only for Americans but also for a growing number of tourists from Europe and Asia, especially China. Honolulu is a rare combination because it is a modern looking American city, which, however, is touched by the deep traditions of the local population. Over the last few years, as a result of its gay friendly reputation, the Pacific Mexican resort city of Puerto Vallarta has become the world’s top destination for gay tourists. In addition, it is among the most preferred places to spend your Christmas and New Year holidays on the beach. It is one of the most attractive Mexican resorts and offers superb beaches, delicious Mexican cuisine, as well as the opportunity to experience and touch the rich and diverse Mexican culture. The weather here is lovely all year round and the Christmas temperatures do not differ significantly from those in the height of summer. Costa Adeje is one of the warmest places in Europe and there’s an easy explanation. The site is located on the southwest coast of Tenerife, not far off the African coast (Morocco and Western Sahara). Costa Adeje consists of several very popular resort towns, including Los Cristianos and Playa de Las Americas. Costa Adeje is a very popular tourist destination among European tourists. They come here throughout the year because of the glory of Tenerife as one of the places with the best climate on the planet. The luxury Brazilian resort Jurerê Internacional is a popular place that every summer attracts the elite of Brazil. The Christmas and New Year holidays are probably the period that attracts the biggest crowds of tourists. In this part of the year people usually have a lot of free time, and in addition, the warm weather is guaranteed. During the late December the summer heat reaches even the cooler southern part of Brazil, so this is the perfect time to spend at least a few days here. The place is often compared to Miami Beach and the similarity is really obvious. The beach is exceptional, covered with fine golden sand. Over the Christmas holidays here are often organized various beach parties, which guarantee that you will not be bored. If you need to determine which is the most popular destination for American tourists in winter, Los Cabos will definitely share the top spot with Florida and Hawaii. Located in the southern tip of the Baja California peninsula, the resort center undoubtedly offers one very important advantage and this is the guaranteed dry, warm and sunny weather. The probability of rain throughout your holiday is extremely small because the climate here is traditionally very dry, so you can really enjoy an entire Christmas holidays without missing even a single day of your vacation staying in the hotel room because of a rainfall. The popular Dominican resort of Punta Cana is a top destination for winter holidays, attracting thousands of tourists from around the world, especially in December, during the Christmas holidays. It is believed that the beaches of Punta Cana are among the best in the world. They are snow-white, and the sea water is irresistible with its azure colour. As Punta Cana offers the best winter weather you could think of, it is considered one of the most attractive places to spend Christmas and New Year along the coast. At the same time, the temperature is very pleasant and you don’t need to deal with unbearable heat or very high humidity. Another advantage is that during the winter months there are no hurricanes, which are quite common in the region during the summer months. 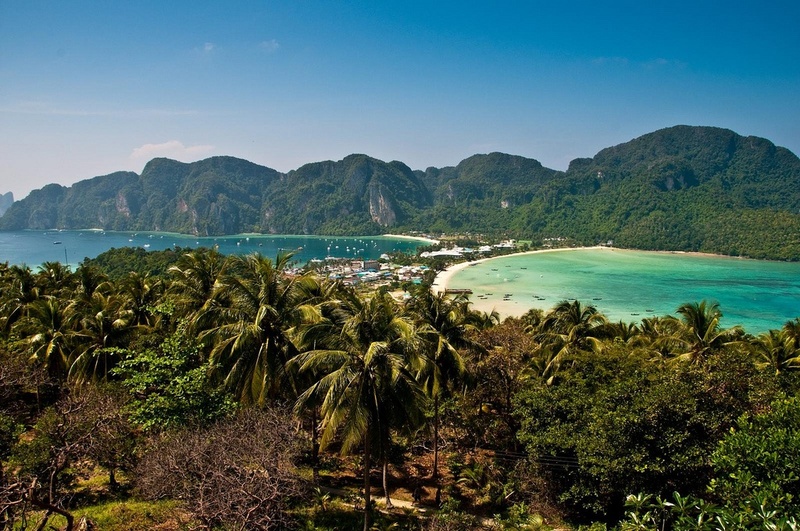 Despite the tragedy that happened in Phuket in December 2004, when a devastating tsunami hit the coast of the Indian Ocean in Thailand, today the country is again among the most popular tourist destinations in the world, and Phuket attracts a huge numbers of visitors. The island is so beloved as a tourist destination that it usually occupies the leading positions in almost every ranking of must visit places, whether it comes to beaches, opportunities for fun, food, climate and or something else. Although Buddhism is predominant in Thailand, locals are strongly influenced by the constant flow of thousands and thousands of tourists from Europe and America and their western culture. That’s why today Christmas is something quite common here, and many local people celebrate despite their religion is very different.